MOSCOW, Russia -- Moscow's upgrade to its Black Sea Fleet – headquartered with Ukraine's blessing at Sevastopol – could make waves around the Black Sea, where NATO has a strong presence. 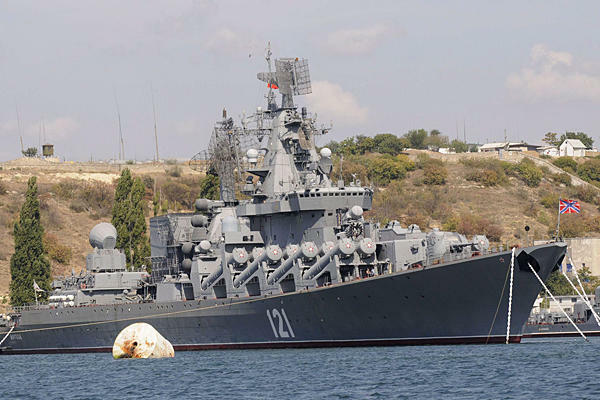 The Russian missile cruiser Moskva sits anchored in the Black Sea port of Sevastopol, Ukraine. Just a year ago Ukraine was insisting that Russia would be required to vacate the Crimean naval base of Sevastopol when its old lease expired in 2017. That would have posed serious problems for Russian Navy's Black Sea Fleet, which is headquartered there. But today, after pro-Moscow President President Viktor Yanukovych took office in February, Russia appears completely secure in its military foothold on Ukrainian soil until at least 2042. In a quiet announcement Monday, Moscow revealed that – with Ukrainian consent – it will "upgrade" its Black Sea fleet over the next decade with at least 18 new warships, including six new frigates, six submarines, two giant troop-landing ships, and new squadrons of naval aircraft. "I am quite sure that the Russian Black Sea fleet will stay in Ukraine till doomsday," says Kirill Frolov, an expert with the official Russian Institute of Commonwealth of Independent States. The Russian naval upgrade is likely to cause waves around the Black Sea, which is bordered by NATO members Romania, Bulgaria, and Turkey, as well as Ukraine and Georgia. The NATO aspirations of Ukraine and Georgia, both former Soviet republics, had stirred strong concerns in Moscow. But with NATO rules stipulating that member countries may not host non-NATO foreign military bases on their soil, Mr. Yanukovych's agreement to prolong Russia's grip on Sevastopol would seem to block Ukraine from even considering joining the alliance for decades to come. Since the narrow electoral victory Mr. Yanukovych in February, Ukraine's previous pro-Western drift has gone into sharp reverse. The Slavic neighbors now seem headed into a full strategic embrace. Under former President Viktor Yushchenko, Ukraine was committed to quickly joining NATO, but Mr. Yanukovych put an end to that last April by quietly closing down the government commission that was preparing for the move. According to an agreement last week between Russian Defense Minister Anatoly Serdyukov and his Ukrainian counterpart Mikhail Yezhel, Kiev is now on board with Moscow's wish to restore the potency of its Black Sea naval arm. Until now, the Black Sea fleet has been mostly rusting at anchor in Sevastopol since the collapse of the USSR almost two decades ago. When Russia and another NATO aspirant, Georgia, fought a brief summer war in 2008, Ukraine – which sympathized with Georgia – complained about the use of Black Sea fleet warships deployed against Georgia from Ukrainian territory without Kiev's permission. Russia now says it will inform Ukraine about any future movements of the fleet in advance. Some Ukrainian analysts say that's not enough. "If the fleet is situated on Ukrainian territory, any actions it makes should take Ukrainian interests into account," says Andrei Yermolayev, director of the Sofia Center, an independent think tank in Kiev. "I think Ukrainian military specialists, security experts and politicians have to be given facts about the modernization. We have a right to know what are Russia's plans, goals, and strategy." Last week the two defense ministers also agreed to broaden military cooperation, including holding joint war games in Russia's southern region next summer. "We think that modernizing the Black Sea Fleet is beneficial for Ukraine as well as Russia," says Mr. Frolov of the Russian Institute of Commonwealth of Independent States. "First, Russia is paying an enormous rent for the use of this base. Secondly, the fleet not only protects Russia but also Ukraine." Last April, when Yanukovych agreed to extend the Russian Navy's lease on Sevastopol by 25 years in exchange for a 30 percent discount on Russian natural gas, the Ukrainian opposition in parliament hurled smoke bombs and denounced the deal as "a black page in Ukrainian history." But protests Monday were muted, with Ukrainian analysts pointing out that the bargain to retain the Russian fleet in Sevastopol remains widely popular among Ukrainians – polls show that about 60 percent approve – and many hope the Russian presence will yield further economic benefits. "I don't think anybody is very indignant about the Russians modernizing their fleet," says Viktor Nebozhenko, director of Ukrainian Barometer, an independent Kiev think tank. "It's their own business. It would become intensely popular among Ukrainians if they decided to build some of those new ships in [the languishing Soviet-era military shipyards near the Ukrainian port of] Nikolayev," he adds. "We need the jobs."